One of the great things about the Lakes is the hospitality and friendliness you'll find there. No matter what kind of accommodation you choose to stay in, you'll find excellent service and comfort. If you're looking for a comfortable hotel, in the mid to upper price range, there are hundreds of excellent properties to choose from. We've listed a selection below; these have all been recommended to us by family and friends, or we've stayed there ourselves. We'd love to hear from you if you have any comments on these hotels or if you have a favourite Lakes hotel which you think is worthy of inclusion in this guide. Do remember that stars are not always a guide to the comfort level you may expect to experience, since small hotels may not have some of the features like lifts (elevators) and night staff that are required for a high star rating. If you're a hotel owner, and would like to be included on this page, please see our contact page for details. 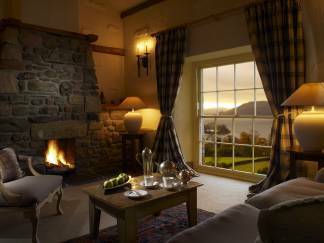 The Samling hotel is renowned as one of the most luxurious hotels in the country. And no wonder. One look at its website will show you that staying here is an experience different to almost any other hotel you've ever visited. Set in 67 acres of classic Lake District landscape, the hotel consists of 11 beautifully appointed bedrooms with stunning views over Lake Windermere. The restaurant at The Samling uses the finest, freshest local ingredients cooked to perfection and has received numerous Michelin stars and AA Rosettes over the years. 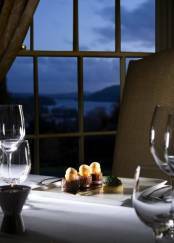 You can easily see why The Samling is one of the most popular hotspots for foodies in the UK! Famous fans at the hotel include Tom Cruise, the Beckhams and Stella McCartney. And while many things about The Samling stand out, one of our own high spots was relaxing with champagne in the hot-tub - it's a must at this luxurious and elegant hotel! A beautiful setting for a hotel run by a company who care about their guests' comfort and relaxation. The hotel has a spa and pool open to hotel guests only, and some beautiful bedrooms with four posters. 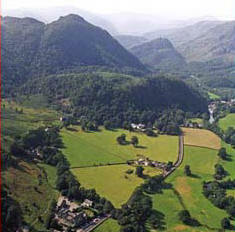 It's also in a good location for exploring Windermere, Coniston and the Lake District Peninsulas. Run by the same company as the hotel above, this applies the same stringent standards of care and attention to guests' comfort and holiday enjoyment. And a real plus is that they take great care with the sourcing of their food, much of which they actually grow themselves (including the lamb and mutton). In case you're wondering about the name, the damson is a wild fruit which grows extensively in the south Lakes - and makes a delicious jam. The hotel has a swimming pool. This hotel certainly has a glorious setting - no wonder, as all the hotels in the small family group which owns it seem to have been chosen for their spectacular views! With a swimming pool, great food (the hotel has 2 AA rosettes for food - a high accolade indeed) and bedrooms with stunning views, what more could you wish for? Some of the bedrooms have Jacuzzi spas and one or two have king-sized beds. On the shore of Lake Windermere, just a short distance from Bowness. Set in the Gilpin valley and named after Sir Richard Gilpin, who famously killed a wild boar nearby, this old coaching inn lives on as a comfortable country style hotel, with a great location and comfortable bedrooms. Run by English Lakes Hotels, a company who certainly know what they're doing when it comes to hotel management. 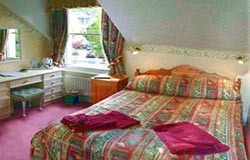 A tasteful and pleasant hotel situated in a wonderful location, overlooking Bowness and Windermere. With a pool and leisure club available nearby, and rooms to suit all tastes, this is a reliable hotel with a good reputation (and a very decent restaurant with a spectacular view). This hotel certainly has its fans. In a beautiful location and run by a family who care about what they're doing, this hotel has consistently been praised by our friends and relations for the friendly attitude of the staff, the good food, the comfortable rooms, and the reasonable prices. All too often in the Lakes, small hotels charge too much and the standards are a disappointment. Here at Hillthwaite they have the balance just right, and they are deserving of the success they have achieved. And they have a heated pool and a sauna/steam room. An absolute gem of a hotel in the Langdale valley, praised by all who stay there for its comfort, superlative views, fine cooking and general all-round air of relaxed comfort. Truly a hotel to have a wonderful break from the pressures of everyday life. 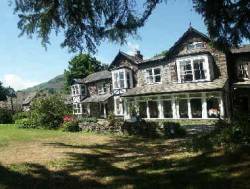 We also have another hotel - The Daffodil Hotel (https://www.daffodilhotel.co.uk), located on the shores of the water at Grasmere, a short 5 minutes from the village centre. The Spa at the hotel features a thermal pool, steam room and a sauna making it the perfect place to relax, unwind and enjoy a well-deserved treatment or two. A charming hotel run by two sisters who'll give you a warm welcome and a comfortable bed; some rooms have Jacuzzi spas. A small hotel, so you'll have to find somewhere to eat out in the evening, but with all the attractions of Ambleside close at hand, that shouldn't prove too difficult to arrange! 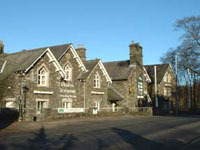 This hotel is right in the centre of Grasmere Village, and has served as the base for many of our walking weekends over the years. 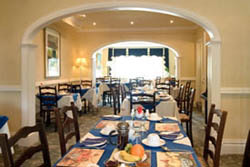 Each time it has produced the same comfortable rooms, high standard of food, and and good service. 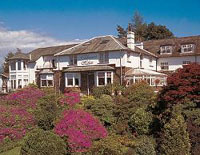 It also has a sister hotel owned by the same company - the Salutation Hotel - in Ambleside. Now, this I really like! A hotel where the website not only gives you an honest view of the hotel's facilities (not, as they say, "stage-managed"), but also an opportunity to see each room and the view from its window before you book. Very clever, and it shows the attention to detail and thoughtfulness of the owners of this 18 room hotel. 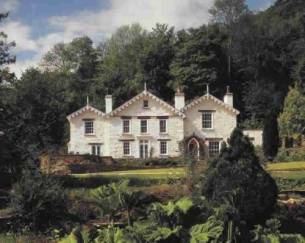 They have an excellent setting by the river, opposite Grasmere's 13th Century Church, in 2 acres of private grounds: in fact, it looks absolutely delightful. And of course, Grasmere is pretty much the centre of the Lakes, so The Bridge House Hotel is right in the heart of the National Park. Even better, as a family-owned hotel it can offer that special personal touch which makes any holiday so delightful. They have special offers well worth investigating - check out the summer, Christmas and New Year breaks, for example. The Grange Guest House, Keswick, offers fine quality bed and breakfast accommodation on the outskirts of the lovely market town of Keswick. Since the property was awarded 5 Star Guest House status by both Visit Britain and the AA in August 2010, you can be assured that your stay will be more than comfortable, and you'll be well looked after by Mark and Sally and the whole team. The wonderful views and location of the Grange, together with the quality of facilities and welcome at this traditional B&B, have attracted returning guests for many years. There are many facilities which you would expect in a 4 star hotel: ample off-street parking, a superb freshly prepared Cumbrian breakfast, free 24hour wifi access, a comfortable lounge, and a scenic outdoor terrace. And the house is fully licensed - which makes the prospect of a cold beer or bottle of wine drunk to the sight of the setting sun behind the fells rather delightful after a long day's walking! There's also a lovely lounge in which you can settle down to read or play chess and other games including backgammon. Howe Keld Hotel is a highly rated property - it has a 4 star rating in both the AA and the Visit Britain rating system - and it's located in one of the loveliest parts of the Lakes, as you can see when you look out from the rooms which face the Northern fells: the view is simply delightful. And, indeed, so are the 15 bedrooms, all of which have ensuite bathrooms equipped with power showers and luxury toiletries. The rooms have been refurbished with obvious taste and good judgement in a cleverly colour coordinated style which is a credit to the family team running the hotel. In my experience, breakfast can be the weakest point of many hotels, so it's a real pleasure to find a hotel like Howe Keld, where breakfast is not so much a meal as a feast. There's a huge choice from the cold buffet, including bread and rolls made from local stoneground wholemeal flour; and if that isn't enough to satisfy you, there's a superb choice of high quality local produce - bacon, Cumbrian sausage, free range eggs, and so on. These high standards are easy to understand when you learn that the proprietors David and Valerie have been associated with the hospitality industry for many years, including venues such as Sharrow Bay, Gravetye Manor and the finest vegetarian restaurant chain in London - 'Cranks'. In summary, the outstanding hospitality from warm hearted hosts, the superb location and the spacious, tasteful rooms make this one of the finest properties in this part of the Lakes. Bear in mind that Keswick is the ideal base for touring the North lakes, especially Derwent water and the northern Lake District fells. 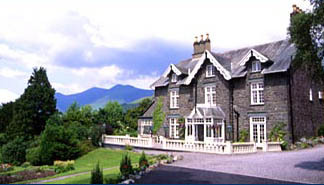 Keswick - Swinside Lodge Hotel is an attractive luxury hotel run by the owners, Mike Bilton and Kath Bilton, who pay attention to all the little details which make a stay in any hotel very special. The number of returning guests is a tribute to the success they have brought to this establishment. This small luxury hotel has seven rooms, each of which has its own character and style, and all of which have stunning views of the beautiful local scenery. 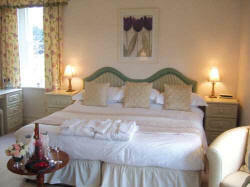 Many guests come back year after year to their favourite rooms, all of which have been refurbished to a high standard. The hotel looks out over the Lake District mountains, and is only a few minutes from Keswick - yet it is a haven of tranquillity and peace, set apart from all the busyness of the Lakes' tourist centres. There is abundant wildlife around the hotel, including the elusive red squirrel in the gardens. Guests who like to dine well will be delighted with the four course dinner which is available each evening; there is a well-chosen and extensive wine list, all of which have contributed to the hotel gaining the rare and very significant two AA Rosettes. Mike and Kath have also been designated "Lakeland Hotel of the Year" by The Good Hotel Guide, and "Lakeland Small Hotel Of The Year" by Cumbria Tourism. Swinside Lodge is perfect for ramblers and walkers, with many beautiful walks starting right outside the hotel door. You can also enjoy Lake cruises on Derwentwater, visits to historic houses and castles, the tranquillity of beautiful gardens, and many local villages and craft shops. 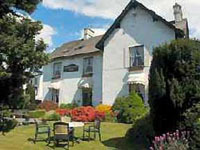 Another of our favourite hotels, run by English Lakes Hotels Limited, which has a second property in Keswick, and another in Borrowdale, this is a reliable, conveniently located hotel which has recently been refurbished and fulfills the expectations of travellers looking for comfort and style at a reasonable price. 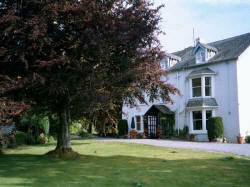 Owned by the same group as the hotel above, the Inn on the Lake occupies a beautiful spot on the shore of Ullswater. This is a peaceful spot, with a lot of charm and an undoubted feel of quality in the hotel facilities. The staff are helpful and practical. The six course silver service dinner is well worth a try. If you like the ambience of a family run hotel, being surrounded by friendly staff, an atmosphere which comes from long-term continued ownership and a happy environment, this is certainly a hotel worth trying. The Borrowdale Gates Hotel is set in beautiful countryside just outside Grange-in-Borrowdale, deep in the rugged beauty of the breathtaking Valley of Borrowdale, perhaps the most scenic in Britain. Borrowdale's charms are increased by the presence of the magnificent lake Derwentwater, which is the widest in the Lake District. 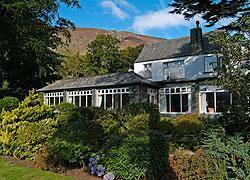 Stay here and you'll be surrounded by some of the most magnificent Lakeland Fells. Most of the rooms in the main house are standard rooms complete with original features and delightful views. All the bedrooms are individually decorated and well-equipped; premier rooms enjoy the same comprehensive facilities with the addition of still and sparkling mineral water, power showers and satellite television. 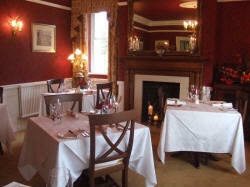 One thing which makes The Borrowdale Gates Hotel such a favourite with guests is the excellent food: the hotel has had a superb reputation for culinary expertise due to the efforts of a team of talented young chefs who work to ensure their food is superb. We're developing a London information resource with information on London hotels and guest houses including excellent recommended hotels in all quality groups.